I thought I knew what a healthy life was. I now realise being healthy is more than going for a run. It’s a lifestyle. I have always exercised regularly, eaten ok and partied a lot! I thought it was a good balance. Until I hit 40. I have spent so many hours running, boxing and pretending to eat well, with no results. Over the last few years I started to realise that exercise alone was not enough. Whilst I have really ramped up my training regime since living in Bali, I have also redefined the way I eat. 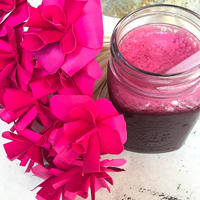 I still love a drink, don’t get me wrong, but I have totally changed my approach to food. I live a healthy life, but I am not trained or an expert in Nutrition. This is my personal experience only. Over the last 12 months I have worked on reducing processed food, dairy and gluten. 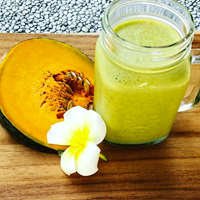 Through this process and adding in a lot more fresh fruit and vegetables I have noticed a massive change in my body and performance with exercise. I have also introduced a whole food supplement into my lifestyle called Juice Plus. Juice Plus is a super whole food packed with over 30+ fruit & vegetables and taken daily. I’ve found the best introduction to Juice Plus and to make a shift for a healthier life is with the 10 Day Shred program. I have done this program and felt amazing afterwards. It is not necessarily a weight loss program, but a kickstart to maintaining a much healthier lifestyle. The 10 Day Shred is a combination of Juice Plus Capsules and Shakes, along with a daily intake of fresh fruit, vegetables and goodness. 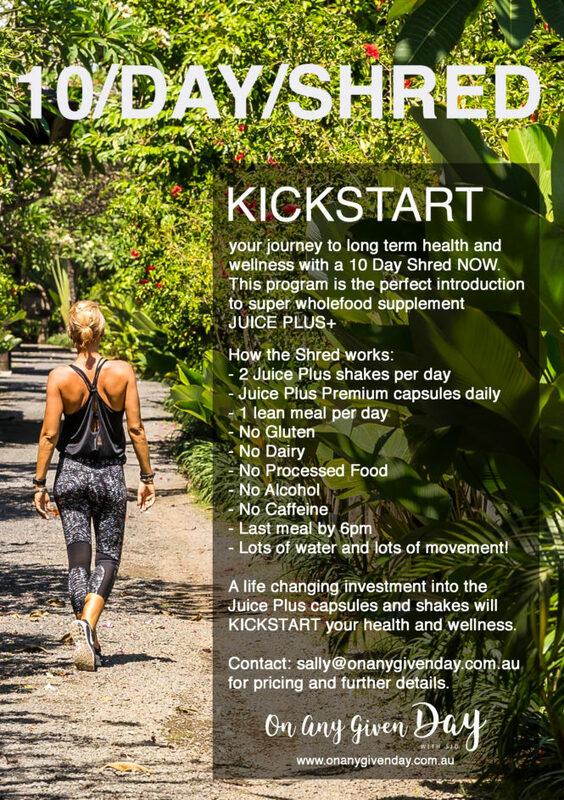 To share this experience we run a group 10 Day Shred program via a closed Facebook Group which offers support, recipes and tips on how to get through the 10 days. The group also provides continued support on how to maintain this approach to your health for the longterm. We are starting our next group 10 Day Shred on 3rd October 2016. See information below on what the shred involves and please contact me if you would like to Shred with us! 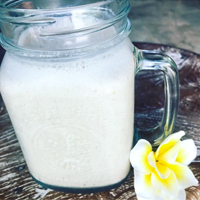 There are so many good recipes to go with the Juice Plus Complete Chocolate and Vanilla shakes. Packing your body with goodness! Add everything from Bananas, Blueberries, Pumpkin (! ), Almond Butter, Chia Seeds and Spinach, the Shakes are like having a treat! WEARING NIKE: Head to Toe.